Chapter 1: Channeling Your Inner Grease Monkey. Chapter 2: Bike Physiology: Understanding How Your Bike Works. 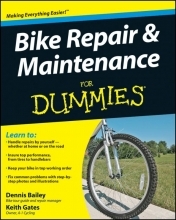 Chapter 3: Setting Up Shop: Repairing Your Bike at Home. Chapter 4: Making like MacGyver: Handling Repairs on the Road. Chapter 5: Help! When You Need Professional Assistance. Part II: Basic Bike Repairs. Chapter 6: Burning Rubber: Tires and Tubes. Chapter 7: Hugging the Curb: The Wheels. Chapter 8: Stopping Short: The Brakes. Chapter 9: Taking Your Seat: Saddles and Seat Posts. Chapter 10: Hitting the Links: The Chain. Chapter 11: Gearing Up: Freewheels and Cassettes. Part III: Shifting into a Higher Gear: Advanced Bike Repairs. Chapter 12: Holding It All Together: The Frame and Suspension. Chapter 13: Putting the Pedal to the Metal: The Drivetrain. Chapter 14: Dropping It into Gear: The Shifting System. Chapter 15: Turning on a Dime: The Steering System. Part IV: Keeping Your Bike on the Road. Chapter 16: An Ounce of Preventive Maintenance. Chapter 17: Regular Bike Maintenance. Chapter 18: Ten (Or So) Steps to Take before You Ride. Chapter 19: Ten Considerations in Fitting Your Bike. Chapter 20: Ten Ways to Improve the Performance and Comfort of Your Bike.